On a purely professional level, 1977 must be judged as a pretty poor year. While the storylines and writing are, if anything, even better than the previous year, and the annual tradition is upheld, there are only ten issues worth of stories produced. Yes, we’ve seen a filler before – the dreadful #154, which was a beefed-up Strange Tales reprint – but here a deadline-strapped Roy Thomas throws in the comic towel for March. Other than Stan and Jack, new talent was brought in, with Ron Wilson drawing the February/April issues, and John’s brother Sal chipping in for May/June. Thankfully, stability is achieved from July onwards, when Len Wein and George Pérez (his name now accented, note) coming aboard from July. All well and good until they have to call upon a second reprint with the December issue, which is the Quazimodo/original Torch story from the fourth FF annual. 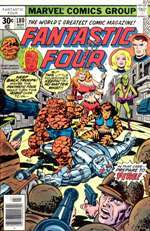 With two issues unable to be completed on time, it almost seems a cheek that they managed to make a 60c annual, though it is produced by an all-new team (to the FF, at any rate) of Marv Wolfman, with Bob Hall & Keith Pollard on pencils. Unfortunately, Bob Wiacek performs some dreadful inking duties, a factor that doesn’t configure on the main series, which is given some unity throughout by the unsurpassable Joe Sinnott working on all twelve issues. Writing-wise, for completeness’ sake, it should be observed that Gerry Conway helped out for the February issue, and May was scripted by Bill Mantlo (plotted by Len Wein, Jim Shooter and Archie Goodwin) and June was written by Mantlo all alone. Of the issues themselves, then Roy’s final three do show sad signs of being rushed. The January issue follows two comedy FF stories, and it does get a little too silly. Perhaps most of note, trivia-wise is Sue defying the laws of gravity – hurled to her death as a cliffhanger, both her hair and her chest stay rigidly glued to their position in #182. Generally though, it’s something of a sad end to Roy’s run, given that in order for the basic plot to function (the alternate Reed Richards poses as the real thing) it relies on the credulity-straining dumbness of his partners.Yet the rest of the Roy-less year is great fun once more. It’s not deep, tightly-plotted or particularly essential… in fact, it’s really little more than the Fantastic Four in a series of super-powered tear-ups against second tier foes. But those foes are new (the likeable Salem’s Seven in particular) and the stories flow nicely from panel to panel with verve and punch. Intricate discussion of plot lines and contrivances isn’t really necessary. We don’t even have to focus on what a dumb name "Hydron" is for a super villain. 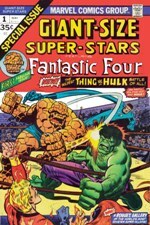 No, 1977 was a good year for the Fantastic Four, and perhaps confirmation that it’s a comic book series best served by being gloriously shallow. One thing of note is that Len Wein removes the supporting characters in so discrete a way that you think they’ve just stepped out for lunch. Just when it seemed that the Fantastic Four would be about the adventures of Ben with Thundra, Tigra and the Impossible Man, the two ladies of the group are seen hailing a cab. Thundra appears again in #191 (and twice more, many, many years later in volume one) but effectively that’s her out of the way. The same can be said for the Impossible Man, who – despite three brief cameos in 1978 where he tries (unsuccessfully) to be a Hollywood star – leaves in a fit of pique during issue #188. It’s perhaps fortunate as his all-conquering powers do threaten to not only undermine the vague realism of the title but also put the FF themselves out of a job. Speaking of which, there’s a large and appreciated shift in Reed’s character during this run. The January issue marks the total disappearance of Reed’s ability to stretch, something that had been developing since #157. (Presumably his powers are too dissipated for the Stimulator of #37 and #40 to have an effect). Tellingly, the first person he confided in was Ben, not his wife, and Reed sees this development as emasculating. However, the loss of confidence in Reed allows Johnny to grow and develop as a character, a far cry from the "shut up, boy!" recipient of just five years previous. In a foreshadow of much later developments, Ben’s leadership abilities are also pushed to the forefront, while Sue (despite being described as the "distaff" member on more than one occasion) is firing offensive force fields everywhere. While the deadline-missing reprints caused it to go on two months longer, we still have seventeen months without Reed’s ability to stretch… something that not only makes you appreciate his powers more when they return, but also allows for some essential character growth. In all, 1977 was a fun time to read the Fantastic Four, and one which, as someone who’s had to wade through the severe quality dips of the mid 70s, I’m extremely grateful for. The only real downside of the year was the 12th Annual. Apart from the sheer nerve of actually daring to produce a special double-length 13th issue in a year where they could only get ten regular issues off the ground, the Inhumans story making up the annual was something of a dirge. The time was when the annual would be a key highlight of a calendar year in the FF, with Stan and Jack producing their best work. Yet here it seems something of an afterthought, with Bob Hall, Keith Pollard and Bob Wiacek producing scrappy, messy art, second only to FF #154 at this stage in terms of inferiority. Of note only for introducing the Sphinx into FF continuity, it presents a story that could not take place at any time during the regular run of 1977, if only for the virtue of having a Reed able to stretch. For once it’s possible to enjoy a run without having multiple references to other Marvel works. The references that are there aren’t exactly essential either, though for references’ sake Klaw enters the October issue off the back of Ka-Zar #20 and Giant Size Super-Stars #1. He meets up with the Molecule Man, who is imprisoned in a staff after a battle with Iron Man (Iron Man Annual #3)… oh, and for clarity’s sake, Klaw’s recollections also require you to be familiar with Marvel’s Man-Thing. Finally,Warlock #6 gets a brief cross-reference in the January issue.